Not likely sent: The Remington-Hearst "telegrams"
W. R. Hearst, New York Journal, N.Y.: "Everything is quiet. There is no trouble here. There will be no war. I wish to return. "Remington." The purported exchange of telegrams in January 1897 between Frederic S. Remington and William Randolph Hearst ranks undeniably as "one of the most famous stories in American journalism. "2 It has been called Hearst's "most quoted single utterance. "3 It is often cited by both journalists 4 and mass communication scholars.5 And it serves as compelling evidence about how the yellow press, led by Hearst's New York Journal, forced the United States into war with Spain in 1898. The supposed exchange suggests not only reckless arrogance by Hearst but also speaks to the powerful potential effects of the news media. That, indeed, was the intent of James Creelman, the sole original source for the anecdote.6 In disclosing the supposed exchange in his book of reminiscences, On the Great Highway, Creelman maintained that the telegrams suggested the power and the foresight of yellow journalism. "Some time before the destruction of the battleship Maine in the harbor of Havana," Creelman wrote,7 "the New York Journal sent Frederic Remington, the distinguished artist, to Cuba. He was instructed to remain there until the war began; for —yellow journalism' was alert and had an eye for the future. "8 Creelman then recounted -- without attribution or supporting detail -- the purported exchange of telegrams and added: "The proprietor of the Journal was as good as his word," in bringing about the war with Spain. Creelman at the time of the exchange was in Europe, as the Journal's "special commissioner," or correspondent, on the Continent. As such, Creelman could only have learned about the supposed exchange second-hand. The contents of the purported telegrams bear little correlation to events in Cuba in early 1897. Specifically, the passages "there will be no war" and "I'll furnish the war" are at odds with the fierce and devastating conflict in Cuba that had begun in February 1895 and had forced Spain to send 200,000 soldiers to the island. Hearst's supposed reply to Remington runs counter to the Journal's editorial positions in January 1897. The newspaper in editorials at that time expected the collapse of the Spanish war effort and resulting independence for Cuban insurgents. The Journal was neither anticipating nor campaigning for U.S. military intervention to end the conflict. It is improbable that such an exchange of telegrams would have been cleared by Spanish censors in Havana. So strict were the censors that dispatches from American correspondents reporting the war in Cuba often were taken by ship to Florida and transmitted from there. The pithy epigram of the purported reply to Remington seems uncharacteristic of Hearst's telegrams. While not voluble or rambling in such messages, Hearst often offered specific suggestions and instructions in telegrams to his representatives assigned to important tasks and missions. It is thus likely that if Hearst had exchanged telegrams with Remington in January 1897, his messages would have contained explicit instructions and suggestions. The contemporaneous correspondence of Richard Harding Davis -- the war correspondent with whom Remington traveled on the assignment to Cuba -- contains no reference to Remington's wanting to leave because "there will be no war." Rather, Davis in his letters gave several other reasons for Remington's departure, including the artist's reluctance to travel through Spanish lines to reach the Cuban insurgents. Davis also said in his correspondence that he asked Remington to leave because the presence of the artist impeded his reporting. Had there been such an exchange, Remington was clearly insubordinate and, as such, risked Hearst's displeasure. Despite Hearst's supposed instruction to stay, Remington left Cuba for New York in mid-January 1897. The Journal subsequently gave considerable prominence to Remington's sketches -- arguably not the kind of response Hearst would have made or permitted in the face of outright insubordination. 1. James Creelman, On the Great Highway: The Wanderings and Adventures of a Special Correspondent. (Boston: Lothrop Publishing, 1901), 177-178. 2 Arthur Lubow, The Reporter Who Would Be King: A Biography of Richard Harding Davis (New York: Scribner's Sons, 1992), 139. 3 John K. Winkler, William Randolph Hearst: A New Appraisal (New York: Hastings House, 1955), 95. Historians have given various versions of the purported Remington-Hearst exchange. One variation was: "You make the pictures, and I'll make the war," see Oliver Carlson and Ernest Sutherland Bates, Hearst: Lord of San Simeon (New York: Viking, 1936), 97, and Oliver Carlson, Brisbane: A Candid Biography (New York: Stackpole Sons, 1937), 120. The purported exchange sometimes has been presented as "you provide the pictures, I'll provide the war." 4 See, for example: Clifford Krauss, "Remember Yellow Journalism," New York Times (15 February 1998): sec. E, page 3, col. 1; Michael Taylor, "The Reign of S.F. 's 'Monarch of the Dailies,'" San Francisco Chronicle (7 August 1999): A9, and "Forget the Maine!" Economist 346 (3 January 1998): 32. The anecdote also has appeared in several books by journalists. 5 See, for example, David Halberstam, The Powers That Be (New York: Dell Publishing Co. Inc., 1980), 295; Allen Churchill, Park Row (New York: Rinehart and Co., 1958), 104; and Willis J. Abbot, Watching the World Go By (Boston: Little, Brown and Co., 1933), 217. See, among others, Michael Schudson, Discovering the News: A Social History of American Newspapers (New York: Basic Books Inc., 1978), 61-62; Ray Eldon Hiebert and Sheila Jean Gibbons, Exploring Mass Media for a Changing World (Mahwah, NJ: Lawrence Erlbaum Associates, 2000), 151, and Philip Seib, Headline Diplomacy: How News Coverage Affects Foreign Policy (Westport, CT: Praeger Publishers, 1997), 5. 6 Creelman's account is the earliest reference to the purported exchange that has been found. Leading journalism history texts that discuss the exchange cite Creelman's book as the original source. See, for example, Frank Luther Mott, American Journalism: A History: 1690-1960, 3d ed. (New York: Macmillan Co., 1962), 529. See also John D. Stevens, Sensationalism and the New York Press (New York: Columbia University Press: 1991), 96. Stevens wrote, "Creelman's memoir is the only evidence for the infamous anecdote about Hearst's cabling Remington that he would provide the war." 7. Creelman did not specifically say when the exchange occurred but Remington's visit to Cuba before the Maine's destruction was in January 1897. 8 Creelman, On the Great Highway, 177. 9 See, for example, Carlson and Bates, Hearst: Lord of San Simeon, 97; Stevens, Sensationalism and the New York Press, 92, and Joyce Milton, The Yellow Kids: Foreign Correspondents in the Heyday of Yellow Journalism (New York: Harper and Row, 1989), xii. 10 Some historians have characterized the anecdote as "legend" but have repeated it nonetheless. See, for example, Jean Folkerts and Dwight L. Teeter Jr., Voices of a Nation: A History of Mass Media in the United States, 3d ed. (Boston: Allyn and Bacon, 1998), 269-270. Mott prefaced his description of the purported Remington-Hearst exchange, stating that it was "said to have taken place." Mott, American Journalism: A History, 529. Other writers have accepted the anecdote without reservation. See, for example, Joseph E. Wisan, The Cuban Crisis as Reflected in the New York Press (1895-1898) (New York: Octagon Books, 1965), 459, and Douglas Allen, Frederic Remington and the Spanish-American War (New York: Crown Publishers, 1971), 11. See also Philip S. Foner, who referred in a footnote to "the famous telegram Frederick [sic] Remington sent to William Randolph Hearst from Havana." Foner, The Spanish-Cuban-American War and the Birth of American Imperialism, 1895-1902, vol. 1 (New York: Monthly Review Press, 1972), 163. Hearst's biographers also have tended to accept the anecdote at face value. See, notably, Ferdinand Lundberg, Imperial Hearst: A Social Biography (New York: Modern Library, 1937), 68, and W. A. Swanberg, Citizen Hearst (New York: Charles Scribner's Sons, 1961), 107-108. Hearst's most recent biographer attempted to qualify the account by stating that Hearst "allegedly replied" to Remington with the vow to "furnish the war." See Ben Procter, William Randolph Hearst: The Early Years (New York: Oxford University Press, 1998), 103. 11 The purported exchange was mentioned in the Times of London in 1907, which prompted Hearst to reply, calling the report "frankly false and ...ingeniously idiotic." See W. R. Hearst, "Mr. W. R. Hearst on Anglo-American Relations," Times (London) (2 November 1907): 5. 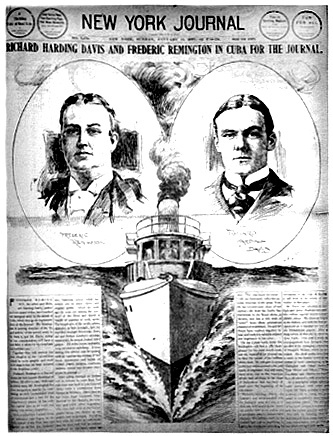 Hearst later was quoted by his son as denying the purported exchange. See William Randolph Hearst Jr., The Hearsts: Father and Son (Niwor, CO: Roberts Rinehart, 1991), 38.